Regardless the outcome in tonight's game 7, we are guaranteed a compelling story. Either the "jump shooting" Warriors put a capstone on their record setting 73 win regular season, or Lebron James and the Cavaliers end the longest championship drought of any major American city. At a macro level, the 2016 Finals has had more than its share of drama and excitement, allowing for the hot take cannon to swing wildly in all directions, firing indiscriminately as the outcome of each game seemed to flip the prevailing narrative. But when it comes to action on the court, the 2016 NBA finals have been the most "boring" of the past 10 years, at least by one measure. For each NBA game, we can use this site's win probability model to calculate an "excitement index". The index measures how much the win probability graph "travels" over the course of the game. It's a concept I stole adapted from the now-defunct win probability graphs from Advanced Football Analytics. The 2016 NBA finals have been largely devoid of any late game heroics that can lead to wild win probability swings. 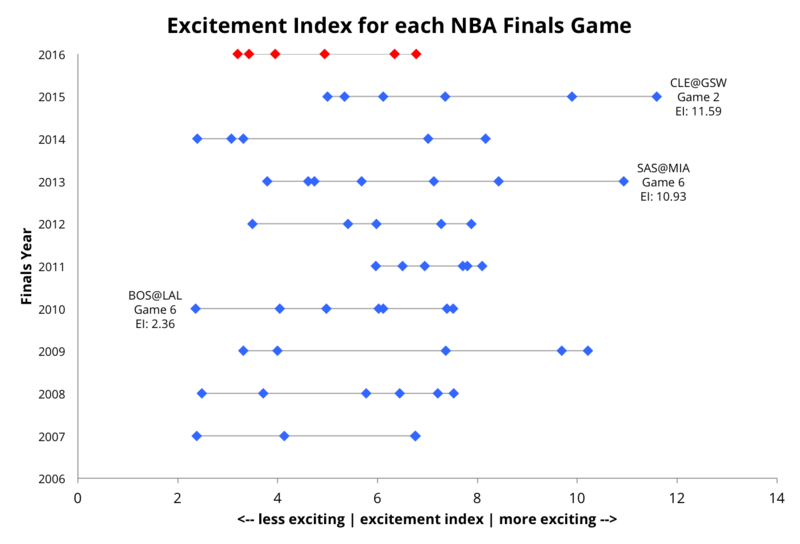 The average excitement index for this year's Finals is 4.77, which, barring a more exciting game 7, would be the lowest in the last ten years, beating the 2014 NBA Finals in which the Spurs beat the Heat handily in five games (average excitement index: 4.79). The most exciting championship round of the past 10 years was the 2011 Finals between the Heat and the Mavericks, with an average excitement index of 7.17. The most exciting NBA finals game of the past 10 years was game two of the 2015 NBA Finals, in which the Cavaliers stole home court advantage from the Warriors in overtime. The second most exciting Finals game was game 6 of the 2013 Finals, featuring Ray Allen's buzzer beater, amongst many other memorable plays. The chart below shows excitement index for each NBA Finals game from the past 10 seasons. We are definitely due for some late game drama.